Some of Western Australia’s best female footballers will grace Optus Stadium’s hallowed turf ahead of West Coast’s clash with Port Adelaide on Saturday. The nine-a-side curtain-raiser clash will feature members of the AFLW State Under-18s squad who have been participating in the Eagles’ High Performance Female Academy. The match, which will pit a West Coast Eagles squad and WA State 18s Academy squad against each other over two 20-minute halves, will only be the second women’s AFL game contested at Optus Stadium. 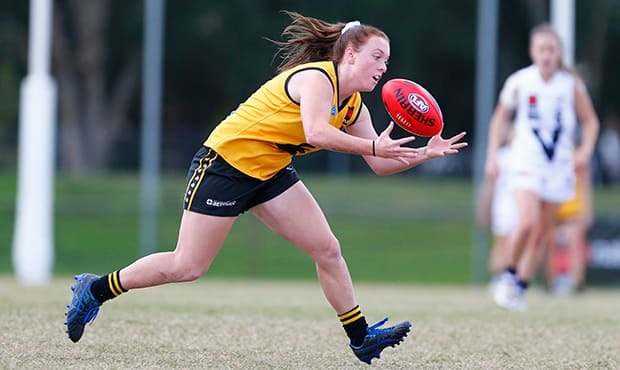 Key players to look out for include Sabreena Duffy, Sonia Dorizzi and Kate Bartlett, who earned all-Australian squad selection at the conclusion of the 2018 NAB AFL Women's Under 18 Championships. Coach of the West Coast Eagles side Drew Petrie said he could not wait for the girls to experience the atmosphere of Perth’s new sporting cauldron. “I’m excited for the girls to be able to play on Optus Stadium and represent the State in front of our fans,” he said. “We’re expecting a fast-paced game on the shortened field, which will allow them to show off their skills,” he said. Eagles Premiership player Adam Selwood will coach the WA State 18s Academy side. One lucky fan will win the opportunity to toss the coin for the match. Make sure you are in the West Coast Eagles Fan Zone at 12:30pm for the chance to win the prestigious honour. Gates open at 12:30pm and the curtain-raiser begins at 12:50pm. Entry is available to fans with a ticket to the Eagles v Power game.